The Associated Press has detailed how O’Reilly made a late entrance to the rally, then after Obama finished his address, brusquely laid hands on campaign staffer Marvin Nicholson in order to grab the best camera angle. According to the AP, the Secret Service had to tell O’Reilly to back off. Obama staffer Marvin Nicholson, a personal aide always at Obama’s side during rope line handshakes, said O’Reilly yelled at him to get out of the way of his cameraman’s shot. Nicholson said O’Reilly came around the waist-high barricade separating Obama from well-wishers. “Then he grabbed me with both of his arms and tried to push me out of the way,” Nicholson said after the campaign agreed to make him available to reporters. O’Reilly, interviewed afterward by phone on Fox News, said he tried “to gently remove” Nicholson because he was standing in front of Fox’s camera. “We’re sorry we had to have that little confrontation, but no one on this earth is going to block a shot on “The O’Reilly Factor.” It is not going to happen,” O’Reilly said. The scene was hard to miss. O’Reilly is about 6-feet-5-inches tall. Nicholson is 6-feet-8-inches tall. “I told him, ‘Sir, I would appreciate it if you wouldn’t shove me anymore.’ He called me ‘low class.’ He was pretty upset,” Nicholson said. Secret Service agents assigned to protect Obama ordered O’Reilly back behind the barricade. At that point Obama approached him and extended his hand. Earlier, the AP reports, O’Reilly had shown up at a campaign event for Senator Hillary Clinton, who had acknowledged him. Before O’Reilly allegedly engaged in the shoving match — which I did not witness — he alternated between staring daggers at Senator Obama and turning his back on the podium and jabbering animatedly with his camera crew. This caught my attention, so I took a series of photos, which are included in this online slideshow of the event. As the photos make clear, almost everyone in the room was having a great time. Except Bill O’Reilly, who looked like he was sucking lemons. is giving me a headache. You have any less obnoxious transition between photos? This is the first time I’ve done a Photobucket slide show. I would prefer a simple cut to the next slide. But I don’t see how to change the transition on Photobucket. This mode seems to come automatically. Maybe if I noodle around I can change it in Photobucket. Otherwise, in future, I’m interested in other online slideshow tools that let me set and modify the transitions. I think I’ve fixed it. I changed the transition to a slow fade. How’s that? Are all candidates now provided this? I thought that the Secret Service kicked in at the moment of nomination. The Service weighs the relative degree of risk and the perceived viability of the candidate in deciding whether to provide protection in advance of a nomination. …that Obama has received are part of the reason it was offered (and accepted). Would that Pakistani candidates received such protection. get SS for life due to persistent threat I believe. I think some sort of time limit has now been put on spouses and children of former Presidents. Ten years perhaps? Does anyone know for sure? 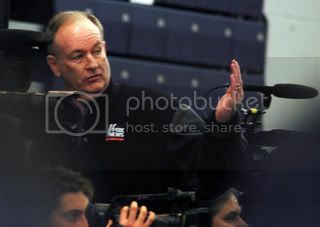 This is my personal perspective on a breaking story about Fox News commentator Bill O’Reilly manhandling a campaign worker at a rally for Senator Barack Obama in Nashua, New Hampshire today. p>…and just what happened to the NH police? It seems to me that “manhandling” amounts to at least assault if not battery. Cynthia McKinney got in a lot of trouble for pushing someone, if I remember correctly. Putting your hands on somebody in an aggressive way is assault. O’Reilly must be starting to feel his influence wane, and is reacting to that phenomenon in typical spoiled-brat, sore sport fashion. I can relate- it’s hard to be proven wrong once or twice; I can imagine what it’s like for guys like O’Reilly, who are wrong all the time.